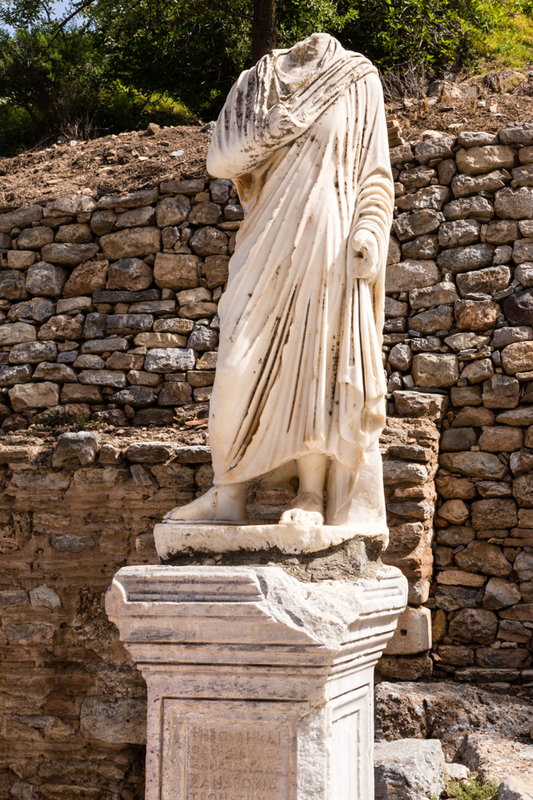 In the ancient world, Ephesus was a center of travel and commerce. For one day, the UNESCO World Heritage site was the center of my world. The marble road leading through Ephesus. Early that morning, Judy, my European traveling buddy, and I met our guide Burcu and driver, Mehmet, arranged through Barefoot Plus Travel. We immediately felt comfortable in their presence. Burcu was knowledgeable about history and culture and very familiar with the ancient site. 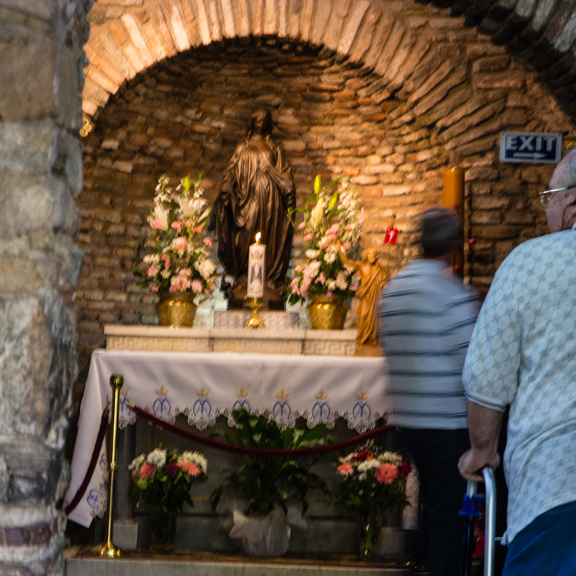 Mehmet picked us from Kusadasi, the main city in the Anatolia area of Turkey, and drove up a mountain for a quick stop at the House of the Virgin Mary. This small stone house has become a pilgrimage destination. Altar inside the House of the Virgin Mary. I took this while standing outside. Ephesus was originally built in the 10th century BC by the Greeks as commercial seaport due to its strategic location. Over time, the river and port silted up and the waterways shifted. The Ionian coast now rests several miles away. Under the Roman Empire (1st and 2nd centuries AD) the city continued to prosper. 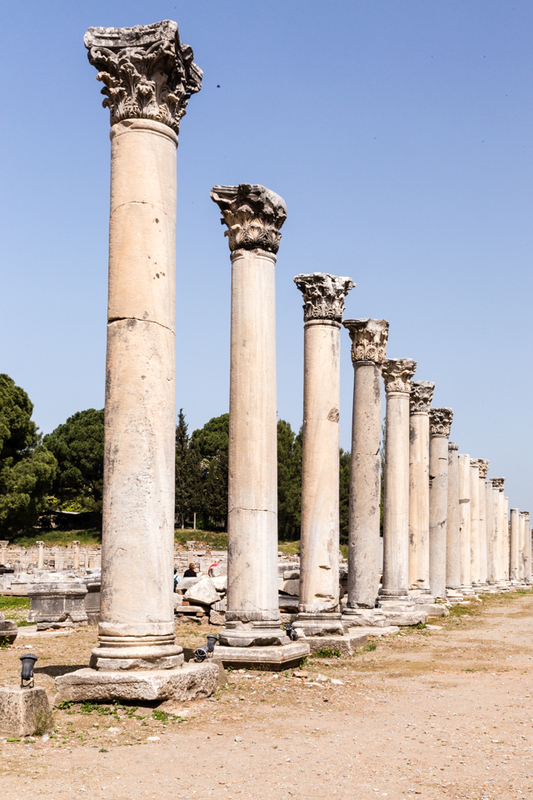 Ephesus became the largest city in the East after Alexandria, with a population of over 200,000. Tours begin at the Magnesian Gate, near the top of a slope. Groups stop at major points of interest as they stroll along, passing the remains of hundreds of columns, statues, and etched drawings. I tried to imagine the bustling white marble city with residents in togas or flowing gowns. Must have been beautiful! First stop was the thermal baths, originally seven stories high. Ruins of the thermal waters bathing area. Then, we entered a theater used for council meetings, concerts or speeches. It could seat 1,400 and remains acoustically grand. The theater could seat 1,400 persons. Terraced houses belonging to the nobles in the city were under archeological restoration, so we could only view their intricate mosaic floors. An Agora or series of shops followed. Mosaic floor of a wealthy resident. We paused (and giggled) at the men’s public toilet area where Burcu explained that a large fountain was used to cover noise and odors. A brothel also sat in this area. We continued down the marble Colonnade to the majestic two-storied Library of Celsus, the highlight of excavated Ephesus, originally built in 117 AD. The structure stands proudly at the base of the slope including statuary copies of the originals. After extensive archeological work in the 1960-70’s, many of the finely chiseled columns were re-erected by Austrian archeologists . I was happy they did so because you can feel the grandeur and size of the original building. In its prime, 12,000 parchment manuscripts and scrolls were kept in the library. Although the niches that contained the parchments were double-lined to prevent humidity or damage, they were tragically lost in a fire. Approaching the Library of Celsus. A grand marble walkway leads away from the library toward the stadium. Burcu pointed out what she called an ancient advertisement carved in the stone. My photo here shows a foot marking the way to the brothel, indicated by drawings of a woman, a heart and the indentation meaning money was needed. Ancient advertisement for the brothel. Look closely to see the face of a lady. You can almost hear the noise of a crowd as you approach the immense amphitheater or Great Theater. In Roman times, up to 25,000 people came to watch staged events including gladiator fights. The nearly intact stadium stands in ancient glory, a memorial to all those who died there. The Grand Theater or Stadium seats 25,000. Training fields and a gymnasium lie beyond the stadium and a cooling tree-covered walkway leads to the exit or lower entrance. Thankfully UNESCO added Ephesus to its World Heritage list in 2015, so it will be maintained and protected. Many cruise ships dock in Kusadasi and bring their guests to the ancient ruins, making Ephesus a popular tourist attraction. Tours last at least an hour and the paths are always crowded, however, Ephesus is enriching, it’s powerful and the memory is everlasting. Just one column remains from the Temple of Artemis. Many thanks to Barefoot Plus Travel for suppling my tour, guide and driver for the day at Ephesus. I cannot recommend a travel company more highly. Jill Diskan, who lives in both the US and Turkey, can answer any and all questions about travel or destinations in Turkey. She is a fountain of knowledge and will make you trip run smoothly.